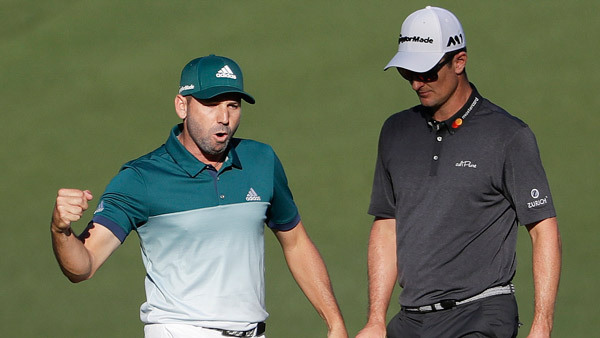 AUGUSTA, Ga. -- Sergio Garcia finally showed he has what it takes to win a major, and he has a green jacket to prove it. No one ever played more majors as a pro - 70 - before winning one for the first time. Garcia got rid of the demons and the doubts with two big moments on the par 5s - one a par, the other an eagle - in closing with a 3-under 69. It was never easy until the end, when Rose sent his drive into the trees on the 18th hole in the playoff, punched out and failed to save par from 15 feet. Rose, who also closed with a 69, lovingly patted Garcia's cheek before they embraced. Rose then tapped Garcia on the heart, which turned out to be a lot bigger than anyone realized. Garcia became the third Spaniard in a green jacket, winning on what would have been the 60th birthday of the late Seve Ballesteros. And it was Jose Maria Olazabal, who won the Masters in 1994 and 1999, who sent him a text on the eve of the Masters telling Garcia to believe and "to not let things get to me like I've done in the past." He didn't get down after missing a 6-foot putt on the 16th hole, or missing a 5-foot birdie putt on the 18th hole in regulation. Everyone figured this was coming, right? Garcia himself had said, in a moment of self-pity, that he didn't have what it takes to win a major. Four times he was runner-up. This was his third time playing in the final group. Not since 1998 have the last two players on the course gone to the 18th tied for the lead, and both had their chances to win. Rose's approach hit off the side of the bunker and kicked onto the green, stopping 7 feet away. Garcia answered with a wedge that covered the flag and settled 5 feet away. The playoff didn't last long. Rose was in trouble from the start with an errant tee shot, and Garcia didn't waste the opportunity.